On this day in 1676, the most Visionary and Prophetic reformer of the entire English Civil War period died at the age of sixty-seven. 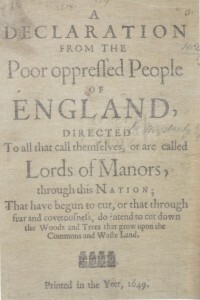 Thrust into the revolutionary times surrounding Oliver Cromwell’s execution of King Charles I, Gerrard Winstanley was one of the few activists clearheaded and radical enough to understand the implications of Cromwell’s daring to lop off the head of a divinely appointed representative of God: ie. King Charles. With Charles dead, many believed that anything was possible – the Levellers, as their name suggests, wanted to bring down the aristocracy, while the so-called Ranters were in actuality an unhomogeneous free-thinking band of individuals preaching everything from free love to free beer. Even the now respectable Quakers were forced to rid themselves of early leaders who grew their hair long in imitation of Christ. But then again, false messiahs and wild-eyed visionaries roamed the land throughout this epochal and often lawless period. Only Gerrard Winstanley and his Diggers wrestled the huge amounts of kinetic energy generating and buzzing from Cromwell and Ireton’s seemingly impossible successes against the far richer and far better equipped Royalists. Seizing the moment, Winstanley and his Diggers occupied St George’s Hill in Surrey, where they set up a proto-commune and declared the hill their own. For several months they dug, defying the parliamentary government’s decrees until they were finally forcibly removed by parliamentary soldiers. Gerrard Winstanley was in his day as extreme and as extraordinary as any of those revolutionary leaders of the 1960s. He saw through culture and saw into people in the way that a prophet sees. He referred to his colleagues and family as “fellow creatures”, and his turns of phrase reveal him as a man of extraordinary poetic mind. Of all the English revolutionaries, Gerrard Winstanley must surely be praised most highly: for his sense of humanity and, even more, for his pragmatism in those outrageous times. 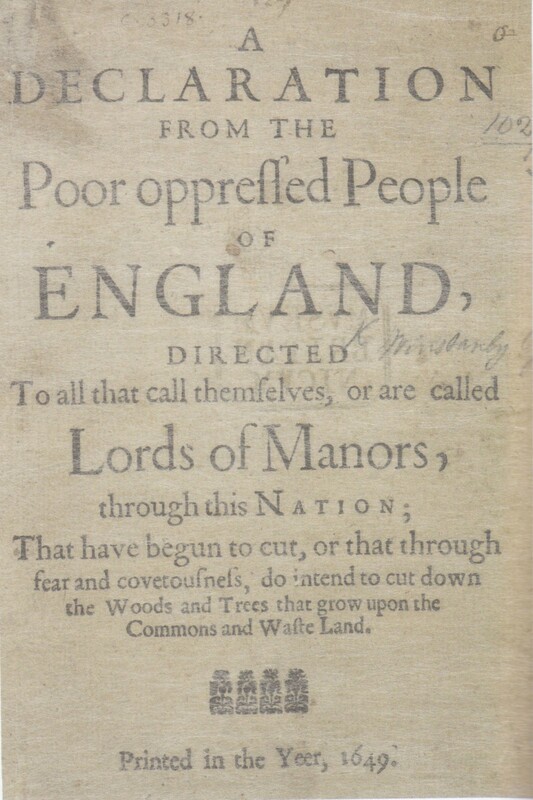 He alone was canny enough to have written a manifesto offering solutions to his Lord Protector, Oliver Cromwell, should Cromwell wish to take advantage of the ideas contained therein. Delusional? Perhaps, but only with the benefit of a third of a millennium’s hindsight. It’s not delusional to be well ahead of one’s time. I think Winstanley would fare little better now, three centuries later. The human race still hasn’t caught up to him. You know , it’s interesting that here in 2015, the sentiment and spirit of that document is still finding ways to express itself, in the recent Occupy and anti-austerity movements and the general upsurge of bile righteously directed at the flaccid institutions of the ‘establishment’. I sometimes consider that what we call ‘Visionary’ is nothing more than the ability to perceive Reality as it is, like Plato’s cave. But thank the Goddess for those that do (including your good self Mr. Cope). Maybe it’s a long shot but I’m studying Psychology as a mature student, in order to do what I can to promote the availability of Psychedelic assisted therapies in the UK, especially for the terminally ill. I also hope that a revolution in our understanding of death and dying may also, in turn, revolutionise our relationship to life and each other, cos the current model aint doing it. Anyway I digress, Here’s to Mr. Winstanley and all those who can see Further. Keep ’em coming.